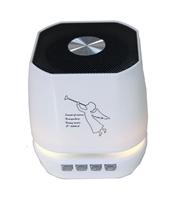 Portable Media Bluetooth Speaker, with colorful Lights and Bluetooth V3.0.Two 5-Watt power, TF Card, Built-in Microphone, FM Radio and USB port in White. 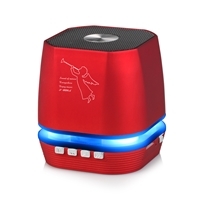 Portable Media Bluetooth Speaker, with colorful Lights and Bluetooth V3.0.Two 5-Watt power, TF Card, Built-in Microphone, FM Radio and USB port in Red. Portable Bluetooth Speaker (V3.0 EDR) with Microphone, TF slot, USB connection, FM Radio and AUX in. 2 5-watt speaker sounds super loud and super bass. Convenient for both indoor and outdoor. Black color. 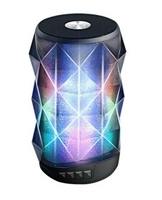 Portable Bluetooth Speaker (V3.0 EDR) with Microphone, TF slot, USB connection, FM Radio and AUX in. 2 5-watt speaker sounds super loud and super bass. Convenient for both indoor and outdoor. Red color. 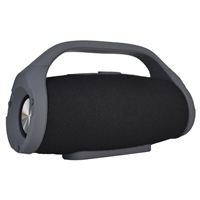 Portable Bluetooth Speaker (V3.0 EDR) with Microphone, TF slot, USB connection, FM Radio and AUX in. 2 5-watt speaker sounds super loud and super bass. Convenient for both indoor and outdoor. Silver color.